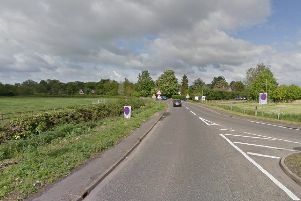 The A605 between Haddon and Elton has now reopened following a double fatal collision earlier this morning (Sunday). A police spokesman said: “We would like to thank members of the public for their patience while we have been dealing with this sad incident. “The fourth occupant of one of the vehicles still remains to be unaccounted for at this time. Police and specialist search teams continue to search for one man thought to have been involved in the crash and who may be badly injured. Officers were called at just gone 2am with reports of the collision involving two cars. It is believed there were four people in one of the cars, however only three have been accounted for. Sadly two of the occupants, both men, have died and a woman is in Addenbrooke’s Hospital in Cambridge with serious but not life-threatening injuries. The driver of the second vehicle, a man in his 50s, suffered minor injuries. This afternoon members of Cambridgeshire Search and Rescue were pulled away from a training exercise near Huntingdon to help with the search for the missing man, who is thought to still be in the Elton area. Chief Inspector Mike Hills said: “We believe there were four people in one of the vehicles at the time of the collision; three men and a woman. “I am appealing to anyone who was driving on the A605 around the time of the collision to contact us if they remember seeing a man walking along the road. The road has been closed in both directions between Haddon services and Elton and is expected to remain closed for some time. Anyone with information about the collision is asked to contact the road policing unit on 101 quoting incident 55 of May 7.